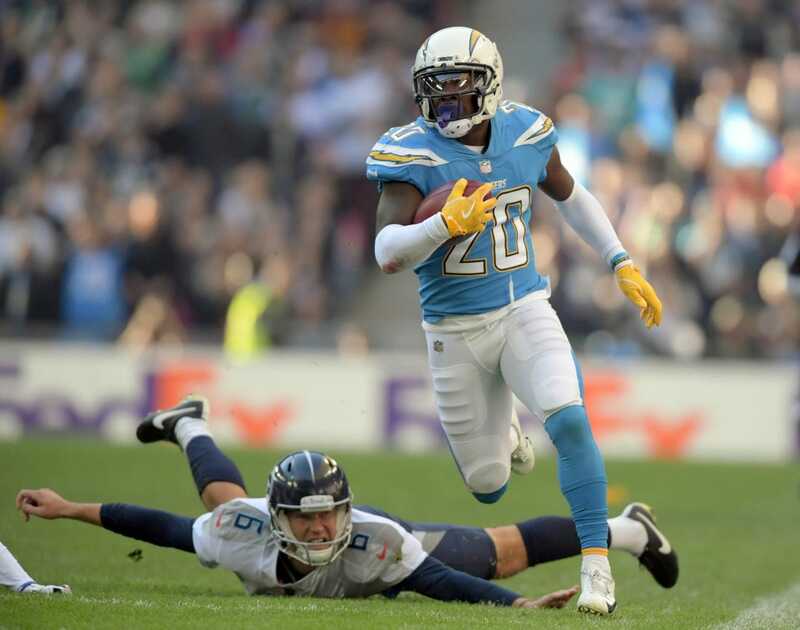 Philip Rivers tossed two long touchdown passes and the quick-strike Los Angeles Chargers survived a late challenge by the Tennessee Titans for a 20-19 victory Sunday at Wembley Stadium in London. Rivers found Tyrell Williams for a 75-yard touchdown on the Chargers' first play from scrimmage and fired a 55-yard TD to a wide-open Mike Williams on the third play of the second half. It was the fourth straight win for the Chargers (5-2) and the third straight loss for the Titans (3-4), whose season-long struggles in the red zone continued. After being shut out last week by Baltimore, Tennessee ended a long touchdown drought when Derrick Henry punched it in from the 1 to cut Los Angeles' lead to 17-13 in the third quarter. It was only the Titans' seventh TD in seven games and their first in the month of October. Mike Badgley's second field goal, from 28 yards, capped a 14-play drive and put the Chargers up 20-13 with 12:30 to play. The rookie also hit from 29 yards in the first quarter. The Titans answered with a 13-play, 89-yard drive, capped by Marcus Mariota's 1-yard touchdown pass to Luke Stocker on fourth down. Trailing by one with 31 seconds left, Tennessee coach Mike Vrabel elected to go for the two-point conversion and the win. Mariota's pass to Tajae Sharpe was incomplete, but a defensive holding penalty gave him another shot. However, his pass to Taywan Taylor was tipped and fell incomplete. Rivers completed 19 of 26 passes for 306 yards and Tyrell Williams had 118 yards on four catches. The 75-yard TD pass was the sixth of 75-plus yards in Rivers' 15-year career, with four of those caught by Williams in the past three seasons. Mariota was 24-of-32 passing for 237 yards, Sharpe caught seven passes for 101 yards and Dion Lewis rushed for a game-high 91 yards, including a 36-yard burst on the Titans' final drive. Tennessee reached the red zone on three of its four first-half possessions, but settled for two Ryan Succop field goals (28 and 33 yards) and trailed 10-6 at intermission despite dominating the time of possession (21:01 to 8:59). The Titans had a first-and-goal just before halftime, but Mariota tossed the first red-zone interception of his four-year NFL career. Melvin Ingram tipped the pass and Denzel Perryman grabbed it at the 4-yard line. Los Angeles played without star running back Melvin Gordon, inactive with a hamstring injury. He entered the weekend as the AFC's leading rusher (466 yards).